Riverside is located right on the banks of the River Wye with spectacular views across the Wye Valley and overlooking Tintern Abbey. This 18th Century stone-built holiday cottage has its own terrace adjacent to the river and a small lawned area with barbecue. Many local pubs and hotels offer home-made food. Riverside has a spacious L-shaped sitting room with open fire, exposed beams, stone walls and rugs on tiled floor. 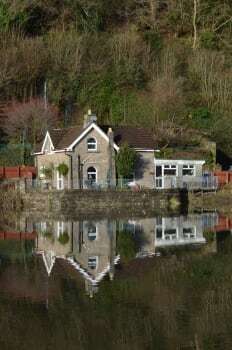 There is a separate dining room and a spacious and well-equipped kitchen with breakfast bar overlooking the river and Tintern Abbey. On the first floor is a beamed 'vaulted ceiling' landing. The first bedroom has a king-size bed with beamed ceiling and overlooks the river. The second bedroom has a double bed and beamed ceiling with an original stone wall. There is a modern bathroom with over-bath electric shower and toilet. The beautiful surrounding countryside is excellent for walkers and dog owners alike with Offa's Dyke within easy reach. There are no rooms available at Riverside Cottage for these dates. Pets: Pets are allowed at a charge of £3.00 per day. Fabulously equipped cottage right on the banks of the river Wye with spectacular views over the Forest of Dean and Tintern abbey. 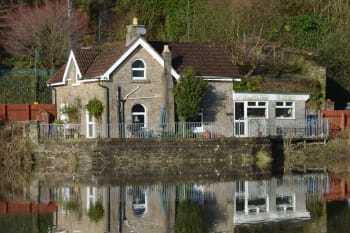 Excellent base for exploring the lower wye valley. Many local hostelries all serving varying quality home made meals. Restaurants varying from Michelin starred Walnut Tree and The Whitebrook to local pubs such as The Anchor, The Fountain, and Rose & Crown. Market towns of Monmouth, Chepstow, Usk and Abergavenney all close and worth exploring. Lovely scenic drive past Llanthony Abbey to Hay on Wye.